On Thursday, April 2nd 2015, Caesar — the beloved family pet of Anthony Gervasi — was sniffing around the end of the family driveway as he’d done many times before. Caesar was never destined for the dinner table. He was a pet who’d lived in the house with the family since he’d arrived, and he was have a grand time enjoying the day’s sunlight and scents. Then a Michigan Department of Natural Resources (DNR) conservation officer shot him. The distraught pet owner Mr. Gervasi, was later informed that the DNR officer hadn’t made a mistake. He was, quite literally, following orders — orders which include killing pets if they step off property. You see, in 2011 the state of Michigan passed the Invasive Species Order (ISO) which defined heritage breed pot-bellied pigs as a feral invasive species — with absolutely no exemptions for those raising heritage breed hogs for farming or preserve operations. The Michigan Pork Producers Association (MPPA) also invested considerable time and money having the swine ISO become law. Enforcing the ISO and the DR against heritage breed farmers raising their pigs in the outdoors would have meant more market share for the MPPA’s confinement operation members along with greater potential to eventually monopolize the genetics of swine in the longterm. In 2012, I wrote about how several hog ranchers had banded together to sue the state of Michigan challenging the Invasive Species Order, and the good news is that they ultimately won. But the Michigan DNR is appealing this ruling, despite offering no better way to actually distinguish truly feral hogs from those raised in agricultural pursuits. And in the meantime, they are still attempting to enforce the Invasive Species Order by arbitrarily killing pet pigs if they step off their owner’s property. But just how was the officer supposed to distinguish between a pet and a feral hog when (thanks to Judge Solka’s ruling last year) there is currently no legal description for what constitutes a feral hog? What is to prevent this kind of tragedy from happening in the future? What can you do to derail this unfair enforcement of an unconstitutional state mandate? Caesar’s owner, Mr. Gervasi, wrote a heart-felt letter to the Michigan Governor Rick Snyder asking him to rescind the Invasive Species Order Amendment No. 1 of 2011. While his story has garnered some publicity, Mr. Gervasi’s letter represents one lone voice. I believe he has the right idea, though. We need to pressure the Michigan DNR to drop their appeal, or in the very least flood Governor Snyder with requests to rescind the Invasive Species Order. To that end, I’ve created a petition that you can sign that will automatically email the governor’s office for you from your email address. The Michigan Invasive Species Order Amendment No. 1 of 2011 and its accompanying Declaratory Ruling were declared unconstitutional and unenforceable by Judge Thomas Solka in March of 2014. Nevertheless, this muddled law is still on the books, and the state’s Department of Natural Resources is using their authority given by the ISO to kill so-called “feral swine” (even if, as in the case of Mr. Anthony Gervasi, those hogs happen to be pets). As of June 2014, when current DNR Director, Keith Creagh rescinded the Declaratory Ruling that so poorly and ambiguously defined the meaning of “feral,” there has been no legal description of what the illegal pigs are. This gave rise to the outrageous situation we’re experiencing today, when pet owners need to fear that DNR officers may mistake their pigs for feral swine and kill them on sight. I respectfully request that you consider following in Mr. Creagh’s footsteps by also rescinding the Invasive Species Order. Just use the form below to sign! Thank you so much for letting your renegade voice be heard! It’s time we put a stop to this egregious law. Not only does its continued existence threaten all heritage breed hog owners in Michigan, but its ambiguous enforcement procedures have resulted in the killing of pets. Sooooo, does this mean that we can consider politicians as pet pigs and this then becomes applicable to them. Just sayin’. I signed the petition… please sign if you can. Food Renegade is a good site. 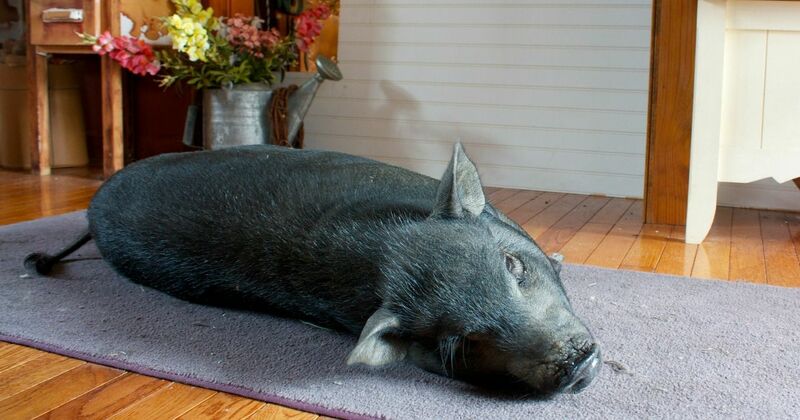 Justice 4 Caesar The Pot Bellied Pig is a local contact for updates. Help the Gervasi family if you can. The Michigan Small Farm Council helps farmers and gardeners in Michigan. The MI DNR and the Governor are out of control. The pork lobby has controlling influence in Lansing at this time. Solutions, will not come easily. Thank you for keeping this story in the spotlight. Respectfully,Tom. Thanks for writing about this. Just to update you, DNR won their appeal. This when you give the government too much power. Unfortunately it’s not going to get any better. i called the governor’s office when news of this bill first went public. i talked to an assistant who got very defensive. Please take a look at This page and share it. Another court date is approaching for the severe animal neglect and public support and media attention is key. Michigan is severely lacking logic these days. I signed the petition. Thanks for bringing this situation and issue back to the foreground. It appears to have fell of the map publicly (I hadn’t heard about this until now). I am sure that Caesar’s owners still feel the loss and are still battling for justice. Has it ever occurred to the fools in Michigan Government the ALL swine in North America are invasive species. Pigs were introduced to the New World by Spanish explorers. The very definition and basis of the “so called” ISO is BS. Furthermore, if the most domesticated white swine escape into the wild, they will grow long hair, darken in color, and become leaner and tougher in only a few generations…which means that Michigan’s “legal” pig farms are the greatest potential source of “invasive feral swine”. While control of feral swine is important to protect agriculture and livestock grazing, the Michigan ISO is obviously motivated by some as yet (publicly) unnamed political special interest group, and NOT on biology or agricultural concerns. Now who has that much money and politically influence in the state?